I adore apricots. I ate my first fresh apricot at 19, in Paris, and it transformed me. Until then, I didn’t realize an apricot was available in any way other than dried. I know that must seem ridiculous. There’s a battle going on in my head – is my favorite fruit an apricot or a sour cherry? These two fruits share a short availability, both early in July, and then – sadly – they are gone until next year. And their flavors are unmatched. When I saw the lovely little blushing apricots at the market last week, I took home four pounds. I ate a lot of them right then and there, and had to stop myself to make sure there were three pounds left to preserve. It was a challenge. The following day, at another market, there were larger apricots, no blush, but still fragrant and ready to be preserved. I purchased six quarts and started planning for some variations on my favorite preserving theme. If you’re crazy for apricots, give one, or all, of these recipes a try. When working with apricots, select firm fruit that smell sweet and promising. Store unwashed fruit in a single layer in a basket. Let the fruit ripen up to three days, until the scent is intoxicating. 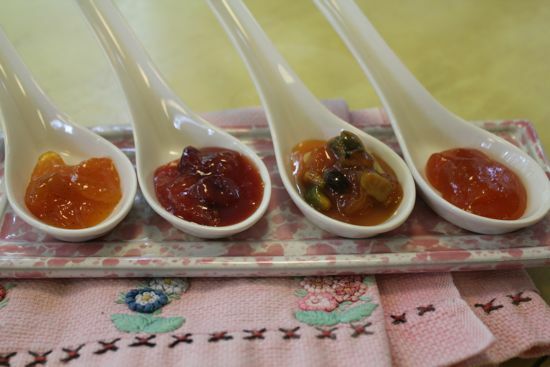 In each of these recipes, I’ve used Christine Ferber’s method for jam-making, for a sweet, but not cloying, soft set, preserves with no added pectin. I start with a ratio of one pound of fruit to one cup of sweetener, and if using alternate sweeteners, like honey or maple syrup, at least half the total must be made up of white sugar (organic or not, it’s your decision.) The juice of one lemon is sufficient for about three pounds of fruit. If you have more fruit, use more lemons. Apricots sometimes need to be peeled, a really horrid task. I’ve found the varieties available to me do not need peeling before preserving. If your apricots have a tough, thick skin, Mme. Ferber offers the suggestion that a quick simmer before maceration overnight will help the skins slip right off. I also believe simmering the fruit briefly before maceration keeps the preserves brightly colored, helping the lemon juice do its work. Three years ago the variety of apricot I found had thick skin that pulled away from the fleshy fruit, easily released the morning after a long soak. Macerate the fruit as usual, and the next day, if the skin doesn’t easily release, abandon that step. You are no doubt working with a thin skinned variety and your preserves will not suffer. Many flavors blend beautifully with fresh apricots. A hint of orange zest seems to make the apricot flavor even more marvelous. Almonds, or almond extract, partner perfectly with the apricot. Try thyme. Or verbena. Or vanilla. 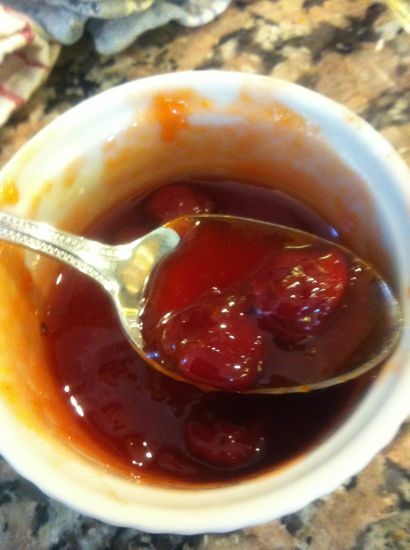 This year, I decided to blend my two favorite fruits, tart cherries and apricots, in to a jam that would speak to me. A little St. Germaine made it perfect. Think about the booze in your cupboard, and whether it will liven up your preserves. As with most stone fruits, this little tart wonder is the perfect start for barbeque sauce. Add fermented black beans, mustard seed, crushed red pepper, garlic, brown sugar and cooked down apricots, or some leftover jam. Simmer this concoction for awhile, then slather on chicken or pork for a great grilled meal. The very simplest, purest preserves. I use this to make fregolatta, to fill rugelach, and stirred into yogurt. It’s so good, I’ll admit – I rarely share. Mix the apricots, sugar and lemon juice together in a preserving pan. Bring just to a simmer, then pour into a ceramic or glass bowl, cover with parchment, and macerate in the refrigerator overnight. The next day, strain the apricots out and heat the syrup slowly, then increase the heat to medium high and bring the syrup to 220°. Add back the apricots and bring back to a boil you cannot stir down. Boil for five minutes, then place in sterilized jars and process for 10 minutes in a boiling water bath. 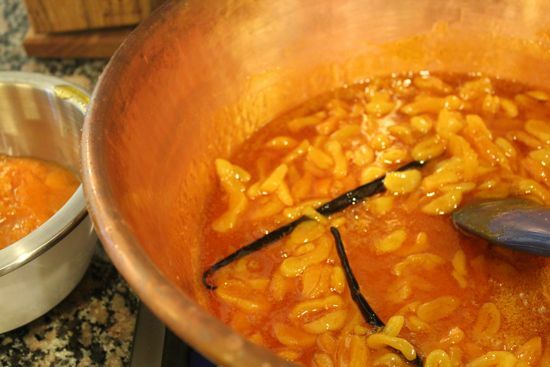 Place apricots, sugar, honey, lemon and orange juice into your preserving pan and bring to a simmer. Pour into a ceramic or glass bowl, cover with parchment and refrigerate overnight. Add back the apricots and the nuts and zest and bring back to a boil you cannot stir down. Boil for five minutes, then place in sterilized jars and process for 10 minutes in a boiling water bath. Cut the dried apricots into very thin batons. Pour the wine over them and allow them to hang out together overnight. Mix the apricots, sugar and lemon and orange juice, and the vanilla beans, together in a preserving pan. Bring just to a simmer, then pour into a ceramic or glass bowl, cover with parchment, and macerate in the refrigerator overnight. Add back the dried and fresh apricots and then add in the zest. Bring back to a boil you cannot stir down. Boil for five minutes, then place in sterilized jars. Add a small piece of vanilla bean to each jar. Process for 10 minutes in a boiling water bath. 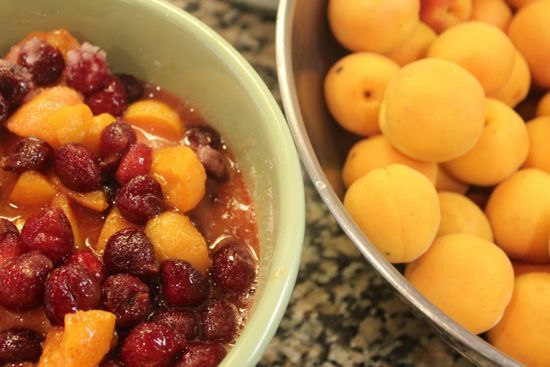 Mix the apricots, cherries, sugar and lemon juice together in a preserving pan. Bring just to a simmer, then pour into a ceramic or glass bowl, cover with parchment, and macerate in the refrigerator overnight. 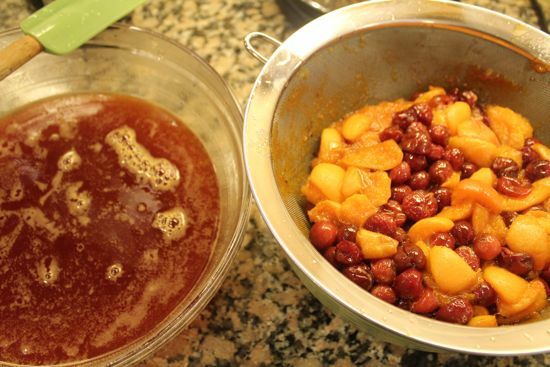 The next day, strain the apricots and cherries out and heat the syrup slowly, then increase the heat to medium high and bring the syrup to 220°. Add back the apricots and cherries. Add the Ste. Germaine. Bring back to a boil you cannot stir down. Boil for five minutes, then place in sterilized jars. Process for 10 minutes in a boiling water bath. I had some dried apricots recently, and today I bought the first fresh ones I’ve had (that I can remember). I’ve been tested for allergies and told that I’m moderately allergic to fruit. But all the fruit they specifically tested for came back negative. So I’m a little hesitant to eat fruits nowadays. But since I’d had the dried ones, I think I’ll be fine. I just thought it was neat to see this post right after my first taste of fresh apricots. Your recipes look delicious. I hope you can find a way to enjoy the fruits of summer! I grew up eating apricots and peaches and all other summer fruit on the beach. I can still remember getting sticky and sandy and having to jump into the ocean to wash off. Now? Fruitwasteland. I love this post. It is awesome and made me drool a little on my iPad. Thank you Janis! I remember summe r fruits enjoyed at the beach and running into the waves to wash off the stickiness. Thank you for bringing back those days. I will be making the apricot with the vanilla but rather than the german wine, I think I will use champagne for a twist. I love making jams. I can’t wait to do this. I would love to get the book you mentioned, Mes Confitures. Thanks for you delecious and post that made me drool. YUM! What a great idea champagne is! Hi, I would like some clarification. I’m wondering what exactly the maceration step does here. I made apricot rhubarb jam last week, basically same ratios, cup of sugar per lb of fruit plus a lemon, and made the jam, but didn’t macerate. Turned out fine. I’m wondering what the macerating is doing, what you’re getting from it, etc.? Can you clarify. I’ve been macerating jams and pie fillings for awhile. I think it helps the flavors blend. But if you dont have the time, don’t bother! Wow wow wow. I mean, I don’t know how to convey how much I love this post. 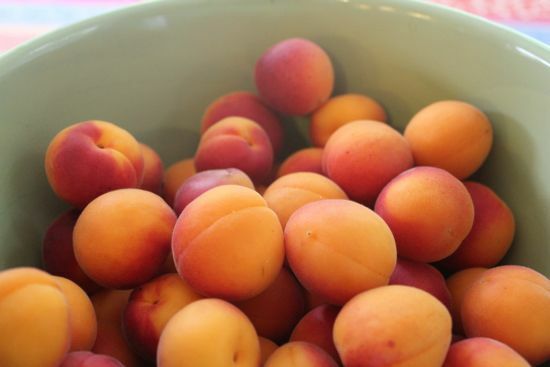 I grew up eating fabulous apricots warm, right off the trees, in Eastern Washington. 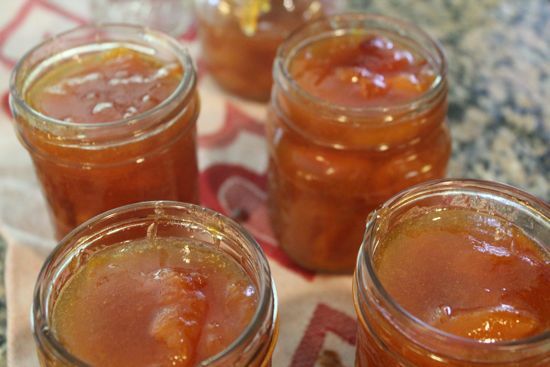 Later, when I started preserving, apricots became my favorite fruit for jam-making, for several reasons. Even when I don’t know what I am going to make, I macerate them just as you do…with sugar, citrus and a vanilla bean. One thing I have never thought to do…and I don’t know why I haven’t, since I adore sour cherries too…is to combine them. I MUST make “The Best of Both Worlds”. Adding St Germaine? Genius. The only thing that would make your post better? Smell-o-vision! Thanks so much Brook. I think if I ever came across an apricot tree loaded with fruit I would eat them til my stomach ached. The very thought of a warm apricot from the tree has haunted me since I read your comment!!! They all look and sound beautiful…will definitely try them out when summer rolls around again in NZ. Just finished putting the simmered apricots for both nougabricot and the gewurz into the fridge! Still on the look out for sour cherries. They seem to be rare in these parts. None at the farmers’ markets this year, apparently. Maybe a trip out to the Hood River fruit loop is in order. But there are tayberries, gooseberries and currants too at the u-pick. Looking forward to hearing what’s next on your agenda — as always, beautiful pictures and great advice. Oh me oh my. My first experience eating delicious fresh apricots was also in france, right off the tree next to the house we were staying in down south. Amazing, and also makes my enjoyment of them double–both the flavor and the memory. What a totally inspiring post. Cherries and apricots together?? Can’t believe I never thought of that. I’ve only made jam but I definitely am going to try the preserves. Not sure if I can get my hands on St. Germaine but am thinking Grand Marnier would make for a tasty alternative. Still waiting on apricots around here, and you’ve made me all the more impatient!! I cannot wait for the apricots to arrive, so I can try out these recipes. Thanks so much for the goldmine. A question: I seem to have overcooked my blueberry jam and it’s really thick and sticky. Is there any remedy or am I stuck with 6 jars of glueberry jam? I picked 3 pounds of apricots from the tree in the backyard, and just did the first part of the prep in this recipe. They’re not macerating in the fridge. I added a bit of orange zest, too. Will purchase more jars tonight, and apricot jam will be mine tomorrow! Oops, that’s “They’re *now* macerating in the fridge”. Sorry for the typo! Go Meg! You have a tree in the backyard??? LUCKY YOU!! and me, I made 8 jars jam so far and have nother 6lb of apricots to do. Then theres the plums……..
Gorgeous pics and recipes! Definitely trying the best of both worlds and the nougabricot! Our apricot trees are loaded this year, but still weeks away from harvest. Sour cherries are on right now, so I’ll have to freeze and use later. We spread old clean sheets out on the lawn under the trees, wait for our apricots to drop, and pick them up several times a day. The sheets keep the earwig bugs away from them. Nothing beats tree-ripened fruit. On a hot summer afternoon, you can hear them hitting the ground with a soft, plop-plop-plop! I think macerating the fruit removes a bit of juice from the fruit making it a bit firmer and less likely to break down as you cook it. This way you get chunks of fruit in syrup which I much prefer, rather than a paste. More like preserves less like jam. As soon as we get ripe apricots I am trying the one with the dried apricots. It sounds so yummy. 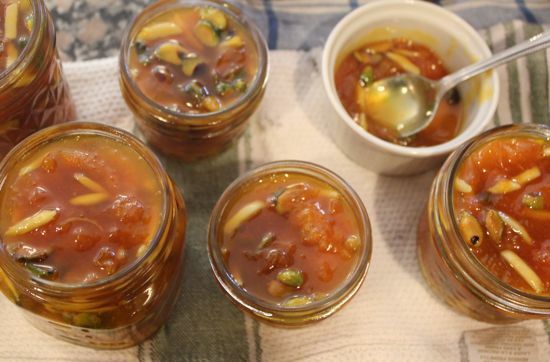 I just made apricot jam with ginger, chili and jack daniels, it’s fabulous! 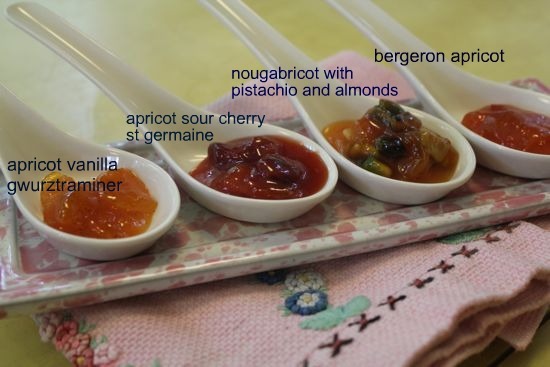 I just put up a batch of the Sour Cherry-Apricot jam. The St. Germain is such a wonderful addition, this jam is gorgeous, and the flavor is sublime. Many thanks!! Thank you Emily. I love that jam, too. I’d graciously appreciate any help anyone might have!! Could you please tell me what kind or typr of apricot that does not need to be peeled. And how can I distiguish it in the supermarket or produce market? Thank you very much. The Local Beet: Chicago » Exploring Mes Confitures: A Treasure of Jar-Worthy Preserves and a Giveaway!